I’ll admit I didn’t get as much work done yesterday as I should have, as my productivity took a tumble due to far too much attention being paid to college football’s National Signing Day festivities. I spent way more time hitting “refresh” on LSU message boards and news sites and looking at player highlights rather than following what was otherwise a relatively slow day in Louisiana politics, and I’m not better for the experience. One reason: the unreasonable wailing and gnashing of teeth among the LSU fans on the internet yesterday over a recruiting class which was ranked 3rd in the nation by Rivals, 5th by 247 Sports and 7th by ESPN. You read that right. Finish in the national top seven by all the services, and as high as 3rd, and the fans are still screaming and demanding coaches be fired. Why? Because Ed Orgeron and his staff didn’t (1) do the impossible and sign one of four defensive linemen from Mississippi LSU never had a great shot to land, and (2) Ishmael Sopsher from Amite, one of the most overrated players in the recent history of football recruiting in Louisiana, picked Alabama. Throwing a fit over what some are calling a “disaster” in recruiting defensive linemen this year is unreasonable and stupid. Here’s why. The coach particularly in the fans’ crosshairs yesterday was defensive line coach Dennis “Meatball” Johnson, a former Tiger walkon who worked his way into the playing rotation as a defensive tackle and earned three letters for LSU from 2009-11. Johnson stayed in college football, first as a graduate assistant at Northwestern State in 2012 and 2013 and then at LSU in 2014 and 2015. He was elevated to outside linebackers coach after Orgeron was named the interim head coach in 2016, holding onto that job in 2017 and then taking over the defensive line from the retiring Pete Jenkins last year. Along the way Johnson has made a name for himself as one of LSU’s most active recruiters. 247 Sports named him the 8th most productive recruiter in the country for this year’s class. Johnson had a hand as a primary or secondary recruiter in landing 11 of LSU’s 25 signees this year. But Johnson is now persona non grata, because he’s from Mississippi and therefore he should have landed either Nathan Pickering, Jeron Handy, Charles Moore or Byron Young – all 4-star defensive line recruits from the Magnolia State. Pickering, who has multiple family members working for Mississippi State boosters, was at one point a silent LSU commitment before locking in with the Bulldogs (not a surprise). Young, who said he was an LSU fan as a kid, committed fairly early to Alabama and never wavered. Handy was a public LSU commitment back in the summer before recanting and Moore, who was a Mississippi State commitment for most of his recruiting process, both ended up picking Auburn. Moore actually told LSU’s coaches Tuesday he would sign with them, which was par for a rather bizarre course where he was concerned. Moore also signed scholarship papers with a junior college yesterday, a good indication he isn’t going to qualify academically to play college football next year. So – a series of near misses. And Johnson is clearly to blame. Clearly. But LSU has had mostly frustration in recruiting Mississippi for decades. That Dennis Johnson hasn’t fixed that in three mere years as an assistant coach makes him trash? It’s lunacy. News flash: outside of the Mississippi Gulf Coast, a region none of those four defensive linemen hail from and perplexingly the least-productive football hotbed in that state, LSU isn’t all that well-liked in Mississippi. “Go to hell, LSU!” is very much a thing north of I-20, much more so than “Go to hell, Ole Miss!” is among Louisiana’s LSU fans who have largely moved on to hating Alabama, Florida and Auburn since the program’s rise in the early years of this century. Mississippi has never been all that productive a recruiting base for LSU, largely because it’s not that productive a recruiting base for anybody. Sure, there are good players there. Per capita, Mississippi is a very productive football state. But its population is relatively small. Its prospects often lack academic eligibility. And every time there’s a star recruit from Mississippi you’re recruiting against not one but two SEC programs situated in the state who have a long history of taking and graduating players from the recruit’s home town if not their high school. LSU can’t match that, because LSU doesn’t take pedestrian recruits from Mississippi – LSU recruits that state’s stars, and only its stars, because when LSU “reaches” for an unheralded player most of the time LSU is taking a Louisiana player. And historically that’s smart, because the three-star Louisiana kids turn into NFL players more often than practically any other state’s three-star recruits do. So if you’re not signing five or six kids from Mississippi every year to build up relationships – and there aren’t five or six kids LSU can easily get from there who are better than what LSU can get from inside the state or from Texas or Florida, so it wouldn’t be smart to pursue that course of action – it’s always going to be tough to recruit well in Mississippi. Yes, Alabama has a lot of success in Mississippi. Alabama has even more success recruiting Florida, Texas and the Washington-Baltimore area. Why? Because they’ve been in the college football playoffs every year they’ve been held, that’s why. That Meatball didn’t fix it this year is not an indictment of Meatball – it’s just how things are. If one of those defensive linemen was from Waveland or Picayune or even McComb, then yeah – LSU probably would have had a better shot at him. But the closest one was Handy, who was from Hattiesburg, and LSU has never really recruited that area well. Pickering is from Seminary and Young is from Laurel, both of which are north of Hattiesburg, and Moore was from Louisville which is less than an hour from Starkville. The odds of landing those kids were always weak. What LSU needed to do was recruit defensive linemen in Texas or Florida. But there were no particularly good opportunities this year in either state. The Tigers had some interest from Marcus Stripling, a decently-rated defensive end from Mayde Creek High School in Houston who ended up at Oklahoma, but Stripling wasn’t a great fit because he’s a bit undersized for a 3-4 defensive end and LSU wasn’t all that high on him. And inside the state there were only two SEC-level defensive line prospects – Haynesville’s Joseph Evans, who did sign with LSU and who is perplexingly underrated (largely because Haynesville might be the worst high school in America where it comes to marketing its athletes as recruits – Evans might be the only Power 5 signee in the country without an updated highlight film on Hudl), and Sopsher. By contrast, in the 2020 recruiting class Louisiana is loaded with defensive linemen. LSU already has commitments from University Lab School superstar Jaquelin (pronounced Ja-KWELLIN) Roy and Haynesville’s CamRon Jackson for next year, and is very much involved in the fight for Live Oak’s Jalen Lee and Alexandria Senior High’s Jacobian Guillory. All four are big-time players who are at least arguably better than any recruit the state had on the defensive line this year. Oak Grove’s Kenean Caldwell is another potential SEC-level recruit inside the state. And yes, Meatball is heading up the recruiting for all of them. It’s not really much of a secret, truth be told. Sopsher has been downgraded by all the recruiting services of late after at one point being rated as high as the top-ranked recruit in the country. Why? Well, because as a senior he didn’t really play all that hard. Yes, Sopsher was named All-State in Class 2A, and yes, he had some impressive numbers – 78 tackles, 35 for loss, 12 sacks – but everybody who saw him play seems to agree he was lazy, took lots of plays off, played way too high and lacked conditioning. Against better competition in camps and all-star games, the word on Sopsher was he was very, very average. Sopsher currently weighs in at 335 pounds on a 6-foot, 3 1/2-inch frame. That’s 50 pounds heavier than he was as a junior in high school when he was seen as a five-star recruit, and none of it is good weight. Sopsher insists on playing defensive end rather than nose guard, a position he can’t effectively play in the SEC carrying that much extra fat. In other words, his value as a recruit is based on somebody coaching the heck out of him and reshaping him as a player. To be honest, that doesn’t happen all that often – more often, what happens is a player like that is a bust. But sure, LSU went all out to recruit Sopsher. 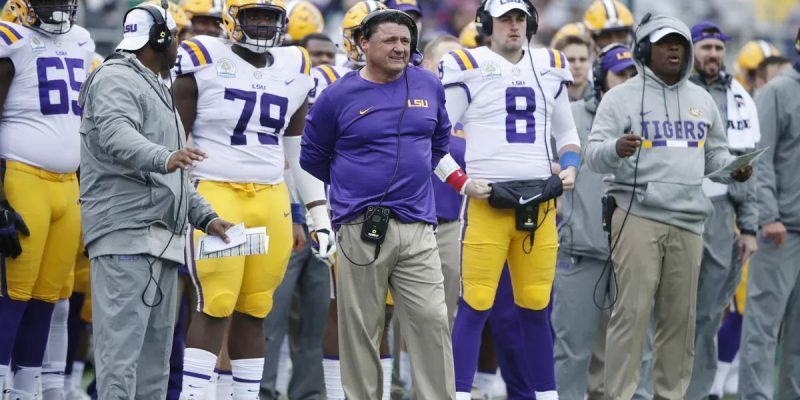 Orgeron even acceded to his demand that LSU offer a scholarship to his older brother Rodney, a low-level junior college defensive lineman whose academic problems kept him from even playing football this past year. The fact that Sopsher comes from Amite, a town of 4,000 people one of whose citizens is Louisiana’s governor John Bel Edwards, had a lot to do with LSU’s solicitousness. Edwards, we heard, made a big deal out of the necessity to land Sopsher – and that didn’t appear to help LSU’s cause much, since when he committed to Alabama he seemed to emphasize his freedom to do what he wanted away from political pressure. Sopsher always wanted to go to Alabama, because his father is friends with Tide staffer Sam Pettito and there’s a local street agent in Amite named Vincent Sanders who steers recruits there. Alabama got wide receiver Devonta Smith from Amite and defensive back Shyheim Carter from nearby Kentwood in recent years thanks to Sanders. It’s a problem for LSU, and perhaps Sopsher – if Nick Saban can squeeze the fat and soft mentality out of him – will be a real coup for Alabama. But let’s not kid ourselves: northern Tangipahoa Parish isn’t going to break this program if a few players escape to Alabama. After all, LSU got two players from that area this year in wide receivers Trey Palmer from Kentwood and Devonta Lee from Amite who were both considerably better than Sopsher. It’s not like the Tigers were frozen out of the area. And it’s also not like Alabama can come into Louisiana and take whoever they want. If that was true they’d have stolen Derek Stingley and John Emery, the two best players in Louisiana who play positions at which the Tide desperately needed help. They got neither, and both are likely going to be starters as freshmen at LSU. In fact, Orgeron landed eight of the top nine players in the state – the only one he wanted but didn’t get was Sopsher, and that recruitment was more about prestige, optics and politics than about football. We should care about football, and not all that other crap. Optics won’t win you ball games. So the perception then took hold that it’s a five-alarm fire and LSU needed to sign three or four more defensive linemen with the six scholarships available to be used this week. That was never really true. LSU is only losing one defensive lineman off last year’s team: Ed Alexander, who opted to turn pro. Of the six defensive linemen who made up the playing rotation the other five are all coming back. Additionally, LSU has four others who redshirted in 2018, giving Orgeron nine returning defensive linemen. Then there’s Evans, who at 6-3 and 305 pounds was all-district, all-area and all-state, has two cousins who combined to play two dozen years in the NFL, is a reigning state champion shot-putter and whose play at Haynesville this year was nothing short of dominant from what we’re told by friends up there. Then Orgeron went out to Salt Lake City and locked down one of the best nose guards in the country in Siaki “Apu” Ika, a 6-3, 380-pound behemoth who was dominant in the All-American Bowl in San Antonio last month; Ika, who is already on campus, needs to lose a good 40 pounds before he’ll be college-ready, but unlike with Sopsher nobody doubts his toughness and work ethic. And then Wednesday LSU signed 6-4, 270-pound junior college defensive end Soni Fonua, a high school teammate of Ika’s whose film marks him as a likely contributor this fall. Nebraska and Oklahoma State were among the other schools pursuing Fonua, who LSU’s coaches fell in love with as they began looking around for other options when it was clear Sopsher and the Mississippi kids were iffy prospects at best. Not to mention LSU has also added 6-2, 275-pound defensive end Michael Williams to the roster as a walkon. Williams, who was a highly-rated recruit out of Dunham High School in Baton Rouge a year ago (believe it or not he played quarterback as well as defensive end and was quite good), got caught up in a numbers game where LSU was concerned and signed with Texas instead. But he didn’t like Austin and enrolled back home at LSU last month, and he’ll be a non-scholarship roster player this year while he sits out under the transfer rules. Williams is nothing to sniff at; he’s athletic as hell and a great kid the coaches really liked last year. By 2020 he might be a factor in the playing rotation. So that’s 13 defensive linemen on the 2019 roster, five of whom played significant amounts last year. LSU doesn’t lack depth at all on the defensive line. What the Tigers need is for Ika, Tyler Shelvin, Dominic Livingston and to a lesser extent Rashard Lawrence and Neil Farrell to drop weight and get a little leaner. Should that happen, it’s not outside the realm of possibility LSU might actually have a better defensive line this fall than Alabama does. After all, there’s a reason the Tide signed eight defensive linemen this year – they don’t have enough bodies coming back. And at every other position on the field LSU’s recruiting class is terrific. They’ve got killer wide receivers in Palmer and Lee, scary running backs in Emery and Ty Davis, five good-looking offensive line prospects (Kardell Thomas, Thomas Perry and Anthony Bradford are locked in on the offensive line while Ray Parker and Charles Turner might start out at tight end but they’ll eventually play tackle and center, respectively), outstanding pickups at linebacker, particularly with Donte Starks and Marcel Brooks, and a haul of defensive backs nobody in the country can match headed up by Stingley – the top recruit in America by some rankings. In fact, it might be that the only reason LSU isn’t ranked in the top three by all the recruiting services is that Orgeron used two scholarships on special teams players, namely kicker Cade York and long snapper Quentin Skinner. Both of those recruits are ranked first or second in the country at what they do, and the recent history of the program should give rise to the conclusion having top-flight specialists placekicking and long-snapping is well worth the hit to the recruiting rankings (the services don’t award much in the way of stars and ratings for special teams players). After all, Cole Tracy was a game-changer for LSU last year and if York is anything like Tracy it’ll be four years of an all-star field goal kicker, and we can’t remember the last time Blake or Reid Ferguson wasn’t true with a snap on punts or placekicks – a tradition Skinner is set to continue when he takes over in 2020. Change those guys out for a couple of four-star wide receivers or running backs or whatever, and LSU is probably ahead of everybody but Alabama and Georgia in the recruiting rankings. This is not a class to melt down about, and LSU fans really ought to be behaving themselves with a bit more composure. Come on, people.